The starting and charging systems are two components of your vehicle that work together to start the engine and provide power to the electrical systems. The Alternator is a key part in your vehicle's charging system. The alternator charges the battery when the engine is running. It also has the function of powering the electrical system of the vehicle, which are the ignition coils, engine fan, headlights, various parts of the fuel injection system, and comfort parts such as the air conditioning system and radio. Typically, an alternator lasts for 8–12 years, so it isn't something that has to be replaced as often as other parts such as the battery. However, running regular checks on your alternator is very important as its failure is not always noticeable. You may hear grinding or squealing sounds right before your alternator goes out. 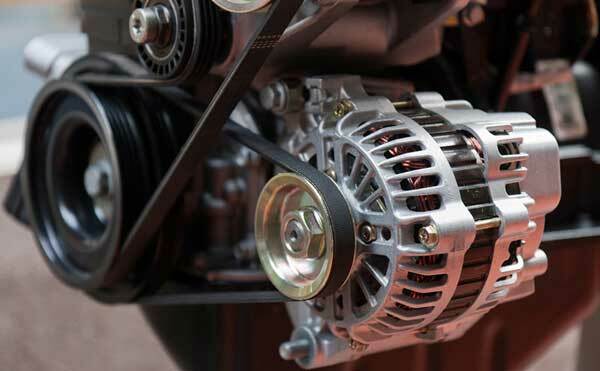 A burning smell or wires heating up may be a result of your alternator overheating. You notice that your headlights or your dash lights flicker or get extra dim. There's difficulty starting your car. If you jump start your car, it might start; however, if the engine dies right after the jump, then, most likely, the alternator is at fault. Electrical issues: your power seats or windows could be slow to operate. Other items that could be affected include power locks, windshield wipers and seats. Dead battery. Without a functioning alternator, your vehicle quickly uses up all of the battery's energy, leaving it drained. A fresh battery and a malfunctioning alternator will quickly leave you stranded again. The Starter is what gets your car running. It uses the electrical energy of the battery in order to turn the engine over to get it to start, which in turn gets your car moving. In other words, without a properly functioning starter, you're going nowhere. The car won't start, but the dash lights will be on. Jump starting your vehicle does not turn over the engine at all. If your car will not start, and you think it's because of a bad battery, alternator or starter, please contact us online or call us at (905) 381-9285. Our technicians will be happy to diagnose and fix these issues so that you can get back on the road again!